A preview of an upcoming exhibition, featuring the work of Lauren Luloff on view November 22-January 11, 2015 at Galerie Bernard Ceysson in Luxembourg, France by ETTD contributor, Kari Adelaide. Lauren Luloff’s new work for an upcoming exhibition at Galerie Bernard Ceysson in Luxembourg, France includes spatial bleach paintings that materialize and exist as sensitive enactments – they are textile objects which blend personal and natural realms with an indefinable element of spirit. To make her paintings, Luloff collects bed sheets from thrift stores, each with their own history, preferring them soft and worn. Her painted imagery intimately branches out from everything close to her, including the sprouting flora in her Brooklyn studio, such as geraniums, begonias, and aloe. 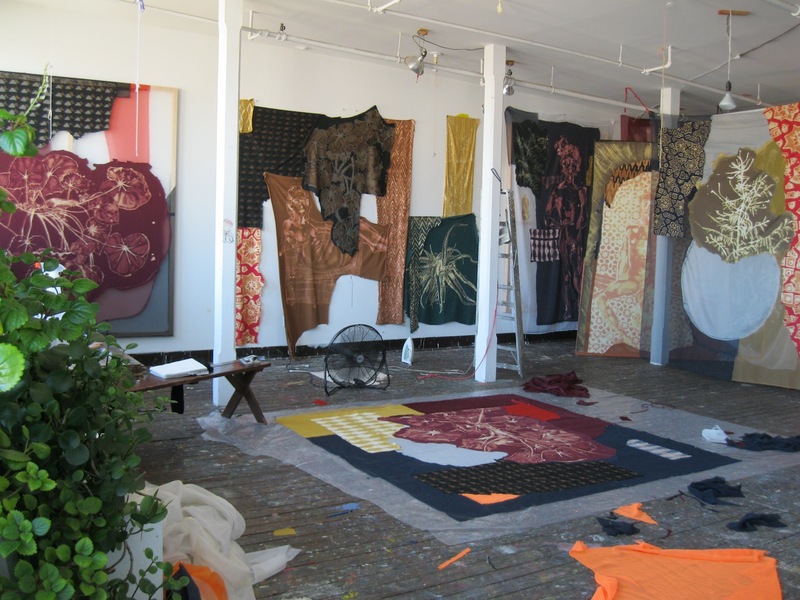 Luloff’s bleach painting process is inspired by her block-printing studies s in Gujarat, India, mimicking traditional techniques of wax resists placed on fabric, a protective covering that allows patterns to emerge after dyeing. 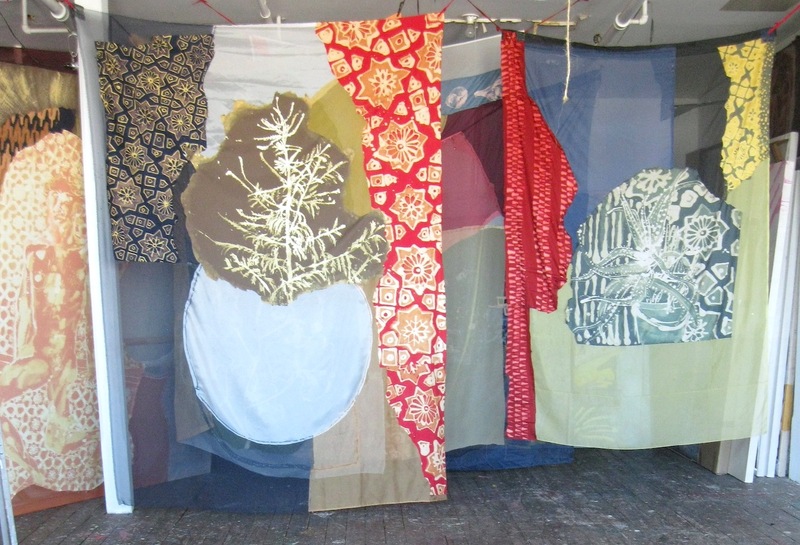 Without wax or dye, Luloff imparts similarly patterned elaborations, yet achieves this by using only bed sheets, bleach, fabric glue, chiffon and sometimes paint. The variously shaped shards of bed sheets are spaced from one another with acute intention, allowing earthly colors to merge with an absence of color. Repetitions of symbols and images on her canvases include emanating stars, maṇḍala encircled flowers, plants, seashells, bodies and vases. 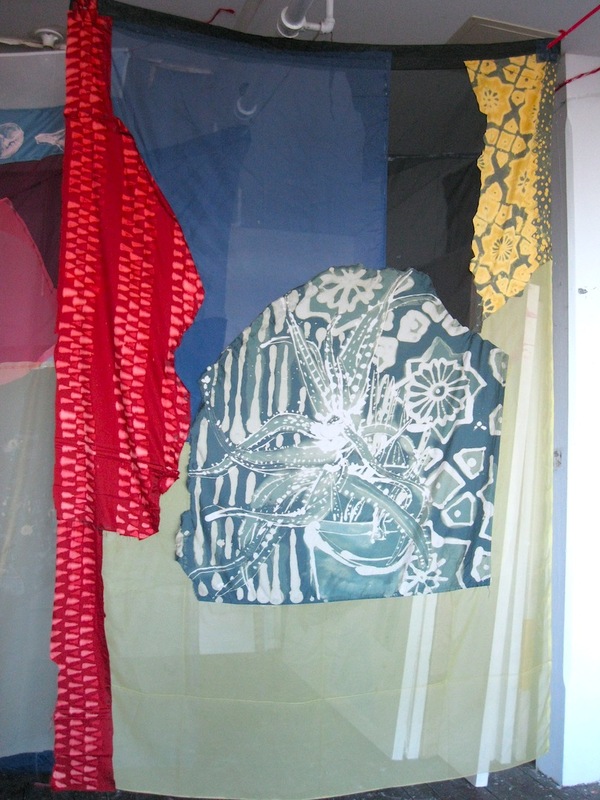 Some of the pieces are meant to hang from above surrounded by open air in a way that allows light to move through the fabric, as Luloff reflected, “They give me a feeling when the light passes through and there’s a different sense of color.” This play of light is heightened by her use of translucent chiffon. Some of the hanging pieces carry an alchemical sentiment, such as a tree (hemlock or spruce) looming over a moon. Luloff’s recent works produce particular states that evoke the concept of mana. In A General Theory of Magic, Marcel Mauss notes that mana is a transmissible quality as well as a substance, capable of being “heard and seen” and dwelling within objects. He writes, “Mana is not simply a force, a being, it is also an action, a quality, a state…it can be used to mean ‘to have mana’, ‘to give mana’…It is represented as a material body.” This brings to mind the manner in which Luloff’s paintings remain apart from direct manifestation of spiritual idioms, yet tend to interact with the metaphysical world. Her interest in letting the surface of the canvas react porously to light reveals underlying structure softly and lets sight treat surface as a passageway. Luloff makes it clear that her paintings are spaces onto which desire can impart its notional essence. To treat the canvas as a mutable plane is to introduce the element of spirit, in this case one that is blended actively with the artist’s life and presence, as an agent and a subject intertwined. Luloff has remarked on the challenge of working with bleach as a medium. Once the bleach takes hold on the textile surface, its borders expand while the liquid runs its trail — colors quickly fade and no further erasure is possible. Luloff reflected on how this sense of finality in image making was especially intense when drawing portraits of those dear to her, such as her husband Alexander Nolan, or her friend Jenn Brehm pouring a vessel of water. While Luloff’s meditative works are wellsprings of sensation, evoking particular states of mind and mood, paradoxically the bleach is a poison of sorts, and its application is as potent and spellbinding as spiders’ venom. A uniform fade surrounds each image, and in many paintings there is a subtle and lingering bleed of color that becomes swollen with light before disappearing into the background’s haze.